Cyclocross started in the early 20th century when French and Belgian road racers wanted to keep fit over the winter. They would race from town to town by the most direct route, often running and climbing with their bikes over fields and walls and through woods. The sport became more and more popular and in the 1940s the UCI recognised it as a distinct discipline with riders competing nationally and internationally. The homeland of cyclocross is Belgium, which with France, Holland, Italy and Germany produces the world’s best riders. It’s huge in America and gets more popular in Britain every year, with the season starting in early September and continuing until January. Races are typically held in parks or estates and feature tarmac, grass, gravel, wooded trails, steep hills and obstacles that riders must carry their bikes over. Invariably, being a winter sport on such terrain means there will often be mud, lots of it! earn points for each race. You can also enter races in any other league. Indeed, some races run under the Forme Notts & Derby Cyclo-cross League (NDCXL) and the Yorkshire Cyclo-Cross Association are nearer Macclesfield than some NWCCA events. Race categories consist of U8, U10, U12, youth (U14 and U16), junior (U18), U23, senior (23-40) and veterans (40-49 and 50+). Juniors race from 15 to 30 minutes, and seniors and veterans for 40 to 60. You’ll find plenty more information under NWCCA and British Cycling. Races consist of a bunch start with a grid formation with league leaders gridded at the front. Courses consist of a lap (shortened for younger races) that faster riders will complete in 6 to 8 minutes. The organisers calculate the number of laps per race based on the early laps recorded by the leaders and display this at the finish line. Cyclocross is, first and foremost, fun and friendly, not least because it’s one of the most accessible forms of bike racing. Whole families attend with most or all members racing and enjoying the camaraderie. It’s useful to have BC membership, but you can buy day membership on top of your entry cost. Cyclocross bikes are dedicated machines equipped sport with wide knobbly tyres and greater clearances to help shed mud and grass. Frames are stiffened and cable routing is designed to enable you to shoulder the bike. A big recent advance has been to allow disc brakes, which are increasingly replacing cantilevers ones. If you want to test whether cyclocross is for you before buying a dedicated bike, it’s fine to use a mountain bike or gravel bike in all but the higher ranking national events. As you become more experienced you will place more emphasis on your equipment and bike set-up such as tyre choice and pressures. Some riders will take a second bike or spare wheels so they can keep racing in the event of a mechanical failure. 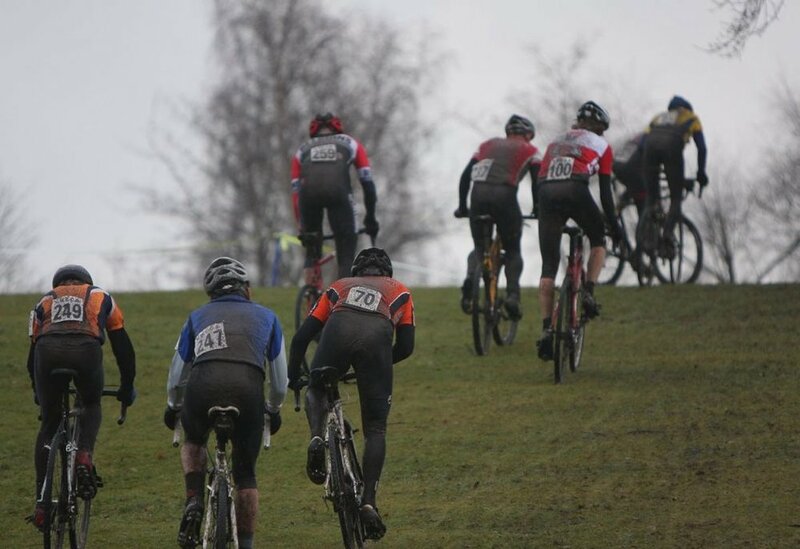 You may start to tailor your training to the particular rigours and demands of cyclocross and practice dismounting and remounting and riding different terrains in different conditions. If you can ride a bike for 40 to 60 minutes, you are fit enough. Whether you complete two laps or eight, you will have successfully raced your way to the finish, at which point you may be exhausted, muddy and wet but immensely proud. You may find yourself battling in the top 20 or for 79th place but you can be sure that every place counts as each competitor does their upmost to gain one higher finishing place. And there is the very real possibility that you will be racing against some of the country’s top male or female cyclocrossers or even an Olympian such as Dame Sarah Storey or Sir Jason Kenny, both of whom have ridden NWCCA events in recent years. You could be lining up against Tom Pidcock and Evie Richards, who are Britain’s brightest hopes of senior success having both been crowned World Cyclocross Champions at junior and U23 level between 2016 and 2018. Enjoy! Join us for an action-packed day of racing on Sunday 29 December 2019. We start with the Youth event at 10.30 am and conclude with the Seniors, U23s and Juniors racing at 2.15 pm. Prize fund of over £2,000. Hot drinks and cakes at Event HQ provided by members of Macclesfield Wheelers, and with all proceeds to charity. Parking available in the Macclesfield Learning Zone on Park Lane, SK11 8JR (signposted Macclesfield College). Please come and support local sport in your local park.